Denis is a high-energy executive with corporate, academic, and community leadership expertise. As Senior Executive Vice President of Challenger, Gray & Christmas, Inc., he has been with the company for almost 30 years. Denis is based in Dallas with responsibility for offices throughout the Southern U.S. He joined Challenger, Gray & Christmas from Club Corp, also headquartered in Dallas, where he served as C.P.O. & Board Member. Previously he was Corporate Director of Human Resources and Labor Relations for Zale Corporation as well as Manager of Headquarters Employee Relations for Frito-Lay, Inc., both headquartered in Dallas. 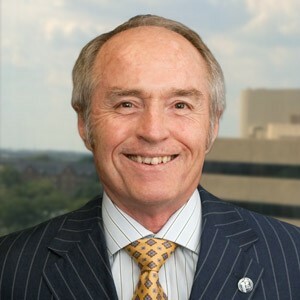 He is currently a member of the President’s Advisory Council at Ohio State, representing the Fisher College of Business, the Dean’s Business Advisory Council at Miami, a member of the Associate Board of the Cox School of Business at SMU, and a member of the Emeritus Board of Trustees at the University of Dallas. He is a decorated Veteran of Southeast Asia and former Army Captain. He is a member of the Board of Camp John Marc, a Texas ranch for disabled children and The Foundation Board for the Family Place, a shelter for abused women and children. Denis earned his MBA from Miami University in Oxford, Ohio in 1973 and his BS in Labor Economics and Management from The Ohio State University. He has taught on an ad hoc basis as an adjunct professor with the Graduate Business Schools: University of Texas at Dallas, Southern Methodist University, and the University of Dallas. Denis has been an ordained Deacon in the Diocese of Dallas the past 29 years, is a member of the Advisory Board of the Catholic Foundation and the Bishop’s Finance Council for the Diocese of Dallas. Ever the adventurer, his 60th birthday was celebrated with an expedition to Antarctica which completed his quest of walking on all 7 continents and swimming in the Antarctic Ocean. His most recent adventures have taken place over the last few years as he has summited Mt. Rainier, Mt. Whitney and Mt. Elbert – the #1, #2 and #3 highest peaks in the lower forty-eight states. This entry was posted on September 5, 2016 by Keely Mobley.